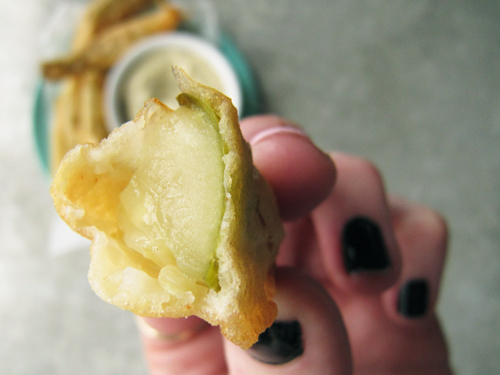 After Cindy and I made donuts, we totally fried these pickles. It resulted in snack-lunch. First, donuts. Then fried pickles for *dessert. *It totally reminded me of the time I had a lamb chop for dessert at another lady hang out. Yum. We opted to get the cutest beer we could find. It was delicious too. We sipped the beer, ate these pickles, and chit-chatted at the kitchen table. I’m dying to know if you guys have ever had fried pickles? Because not only are they delicious, they’re a breeze to make! And I suppose they’re a good food to eat while watching football … or in my case Law and Order. Check out Cindy’s post here! Whisk together the flour, a generous pinch of salt, and cayenne pepper. Add the egg and beer and whisk until mixed completely. Set aside for 30 minutes. Meanwhile, slice up the pickles into short spears and pat dry with a paper towel. When ready to fry, heat 3″ of oil in a pot to 350°F. (Or just fry in the hot oil right after you’ve fried up some donuts.) Line a plate with paper towel and place a baking sheet in your oven heated to 200°F. Once the oil is hot, submerge the pickles in the beer batter. Drop one by one, being careful not to crowd them, into the hot oil. Cook until golden brown about 2-3 minutes. Transfer to the paper towel lined plate and then to the warm oven. 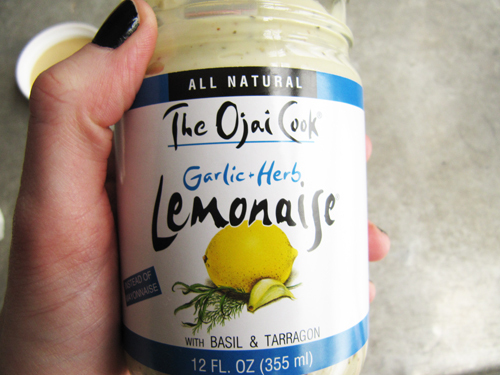 Serve with Lemonaise (below) or with mustard. Normally I’m creeped out by condiments like this but this one is tasty. oh wow… that looks amazing. I think I may have to do that one weekend in the very near future. Doughnuts and pickles. Fried goodness. Oh for sure! They’re a fun and tasty one. Yum! McClures are the best! The fried pickles look amazing… where did you find the lemonaise? I found it at Holiday Market in Royal Oak. They even have a chipotle variety! I’m thinking about those pickles right now! they were so good! Me too! And yeah man. We need to fry the dessert again soon. Yum, I love fried pickles. The best ones are at the Minnesota State Fair, so if you’re ever around these parts in late August, you need to get yourself to the fair. Fried pickles and ranch dressing…nothing better. Oh! Thanks for the tip! I have family in Minnesota so maybe I’llg et to have them someday. This is my all time favorite snack ever! Ooh, yeah. It’s a solid snack, for realz. Nice work on these! The batter looks so perfect. 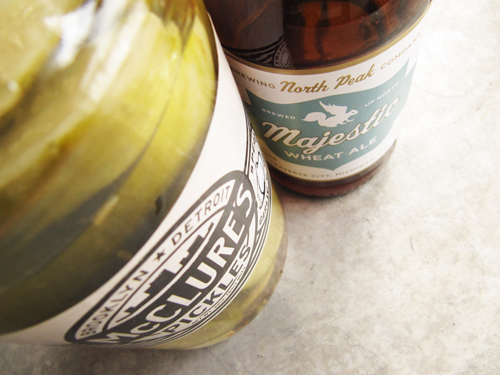 Love the McClure’s pickles and North Peak beers. Goooo Michigan! Thanks, lady! And yeah! Mitten-love! I was just craving fried pickles! Yes! I tend to cave fried pickles immediately after I finish eating fried pickles. Ooh deep fried bananas and yam… hell yes. Mmmmm I <3 Fried pickles dipped in ranch. Soooo good. Yours look heavenly. I am super late to the party but I just started reading your blog and this looks like the best lady date ever. Fried pickles are the best. Fashionably late! <3 I'm glad you found me! 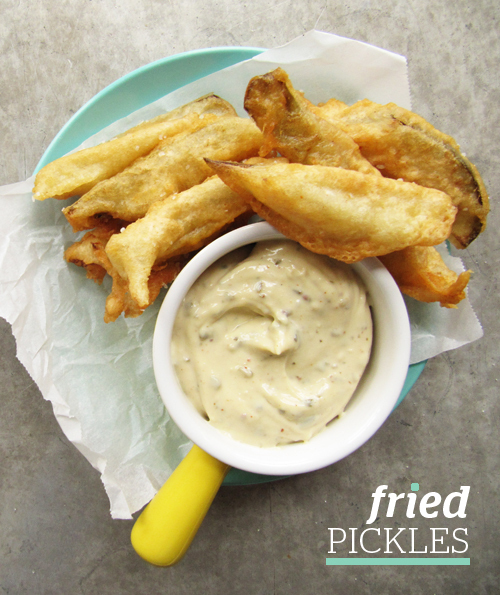 Love fried dill pickles….Try dipping them in blue cheese dressing, you’ll love it!